The ICELDS keeps informing our readers about the outputs of our partners’ project “Securing a Balance in Interethnic Relations: Regional Autonomies, State Integrity and The Rights of Ethnic Minorities,” accomplished by a group of researchers from the Perm University (Political Science Department) and the Perm Research Center of the Ural Branch of the Russian Academy of Sciences (Department of Political Institutions and Processes). Previously, Dr. Petr Panov analyzed the general framework of the linkage between ethnicity and territorial autonomies, and Dr. Nadezhda Borisova focused on language policies and territorial language regimes. The third text of this series by Eleonora Minaeva addresses the opportunities provided by Geographic Information Systems (GIS) for ethno-political studies. Ethnic heterogeneity is commonly considered as one of the most important points in ethno-political studies. Alesina et al. developed the index of ethnic fractionalization to measure ethnic heterogeneity. It shows the probability that two randomly selected individuals in a given country (or a region) belong to different ethnic groups. As a rule, the index is calculated on the basis of demographic data and assumes the value from “0” (if the population is ethnically homogeneous) to “1”. The disadvantage of the ethnic fractionalization index is that it does not show the “weight” of each ethnic groups. For this reason, the researchers also use another instrument to measure ethnic heterogeneity, namely the polarization index developed by Garcia Montalvo and Reynal-Querol. In fact, “polarization is typically maximized when there are two groups of equal size, whereas fractionalization increases when there are many small groups”. Thus, polarization allows the researchers to consider the distance between ethnic groups. At the same time, both fractionalization and polarization indexes have some limitations. For example, in case of two countries with two ethnic groups equal in size, the fractionalization index (approximately 0.5) and the polarization index (about 1) will have the same value. However, if in the first country its ethnic groups are spatially “segregated” (the first group lives in the northern part of the country, while the second group resides in in its southern part), while in the second country its ethnic groups are spatially “mixed”, the “quality” of ethnic heterogeneity significantly differs. Hence, it is necessary to consider how ethnic groups are localized in physical space. It is possible to distinguish between “shared” and “segregated” formats of ethnic group’s spatial localization. The former means that the different ethnic groups live in the same physical space, whereas the later suggests that every ethnic group has its “own” physical space (i.e. they are segregated from each other). Furthermore, since we examine ethno-political processes, a correlation between ethnic and political-administrative boundaries should be taken into account. As a rule, a specific localization of the ethnic groups in the physical space is laregly a consequence of their random long-time historical development. On the contrary, the administrative divisions in the modern states are established by normative acts adopted by the authorities. Indeed, history, geography, economics, etc. influence their decisions, but the political-administrative boundaries are merely a “political construct.” It has particular importance if the ethnic groups are spatially segregated. 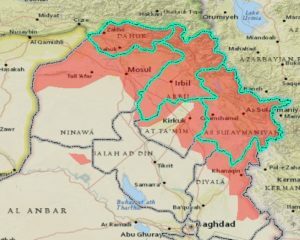 In this case the boundaries can be constructed so that one ethnic group forms a majority or a minority of the administrative unit’s population, one ethnic group is concentrated in one region or is divided between different regions, etc. All these aspects are particularly important for ethnic territorial autonomies (ETA). The ETAs are established on the ground of ethnicity (so-called “titular ethnic group”). These are territorial autonomies. Consequently, their population inevitably includes the members of other (“non-titular”) ethnic groups. In this context, the spatial localization of titular and non-titular groups as well as correlation between ethnic and political administrative boundaries become politically very sensitive. The instruments of Geographic Information Systems (GIS) are useful for the study of these issues. The key idea is to overlay different layers of geographically related data on each other and to accomplish their subsequent mathematical processing with such instruments as, for example, ArcMap program. Since GIS-technologies have been actively developing over the last decade, quite many geographically related databases on the diverse topics were created. For ethno-political studies, it was especially important to create databases on the geographic location of ethnic groups. They are developed on the basis of the Atlas Narodov Mira [Atlas of the Peoples of the World]. Being unique in its kind, it was created by the Soviet ethnographers in 1964 and contains the maps of the settlement of ethnic groups (polygons) throughout the world. With the help of GIS technologies and some refinements, the Atlas was transformed into the Geo-referencing of ethnic groups database (GREG)  and the Geo-referencing Ethnic Power Relations (GeoEPR) database . The Global Administrative Areas database (GADM) can be added to the GREG and the GeoEPR as an additional layer in order to make a correlation between ethnic and political / administrative boundaries. 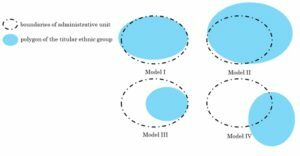 In the case of segregated localization of titular and non-titular ethnic groups within ethnic territorial autonomies, the four models of the titular ethnic group’s concentration in the ETA can be distinguished (figure 1). The first model reflects the almost complete coincidence of polygons of the titular ethnic group and the autonomy. In the second model, the boundaries of the titular group and the ERA also strongly correlate; however, a significant part of the titular group’s members live beyond the autonomy’s borders. The third model deals with the cases when a part of the autonomy is dominated by the non-titular population. The fourth model reflects the weakest degree of congruence between ethnic and political / administrative boundaries. Some studies of the political processes in ethnic territorial autonomies argue that spatial localization of titular and non-titular ethnic groups and correlation between ethnic and political / administrative boundaries influence various aspects of ethnic politics. Certainly, these are important factors of language policy in ethnic territorial autonomies. The usage the mother tongue of the titular ethnic group as the language of instruction in schools depends on how ethnic groups are distributed in the physical space. Moreover, I believe that the “segregated” localization contributes to politicization of the ethnic identity more than the “shared” one, because the members of some ethnic groups live closer to each other and are separated from the members of the other group. 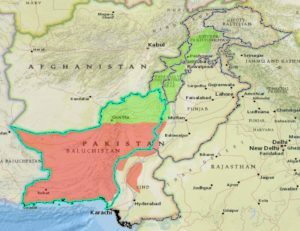 For instance, an ongoing conflict between ethnic groups in the province of Balochistan (Pakistan) stems not only from the distinct ethnicity of the Baloch people (who struggle against the central government), but also from the fact that the territory of the province is divided between the Baloch people (red color on the figure 2) and the Pashtun people (green color on the figure 2). The Pashtuns have their own province Khyber Pakhtunkhwa and put forward claims to unite their lands. For example, the Pashtunkhwa Milli Awami Party (a Pashtun nationalist political party) demands the division of the province along its ethnic boundaries. However, the shared spatial localization cannot is not a remedy against the politicization of ethnicity. While sharing the same territory, the ethnic groups in question can be segregated socially. They can visit different churches, go to different schools, etc. For example, despite the common urban space, the city of Sarajevo is clearly divided into Bosnian and Croatian neighborhoods. They differ in architecture and toponyms, while their residents have different modes of dress and vote for their own parties and candidates. Another characteristic example is Karachi, the capital of the province of Sindh. For instance, its two traditional communities, the Sindhis and the Muhajirs, have the different social positions: while the Muhajirs are successful in intellectual, commercial and official spheres, the Sindhis are engaged in small trade and agriculture. Politicization of ethnicity leads to the formation of ethnic (ethno-regional) political parties. As a result, the political process in the context of the shared localization can be more specific than in the case of the non-ethnic regions. However, the main feature of this situation is that ethno-regional parties interact with the country-wide parties in the same political field. An exemplary case is the region of South Tyrol with its “shared localization” of the three ethnic groups (the German speaking group, Italians, and the Ladin people). A special system of power-sharing emerged in this region and the “German” parties closely interact with Italians. On the contrary, in case of the “segregated” localization format, one can observe Model I or Model II. If ethnic and political / administrative boundaries largely coincide, it is much more likely to expect the formation of a separate regional party system which includes strong ethno-regional parties. This situation can be observed, for example, in Iraqi Kurdistan (figure 3), the Åland Islands, Greenland or the Faroe Islands. The party systems are almost fully regionalized in Belgium, Bosnia and Herzegovina and Pakistan, where all the regions belong to ethnic autonomies. Thus, “segregated” form of localization facilitates to the institutionalization of the ETAs in the form of special separate regional political units. The project “Securing a balance in interethnic relations: regional autonomies, the state integrity and the rights of ethnic minorities” was supported by the Russian Science Foundation (Grant №15-18-00034). Alesina, A., A. Devleeschauwer, W. Easterly, S. Kurlat, and R. Wacziarg, 2003. Fractionalization. Journal of Economic Growth, 8(2): 155-194. Garcia Montalvo, J. and M. Reynal-Querol, 2002. Why ethnic fractionalization? Polarization, ethnic conflict and growth. Economics Working Papers, Department of Economics and Business, Universitat Pompeu Fabra. Alesina et al., op. cit., note 2 above, p. 170. Weidmann N., J. Rød, and L.-E. Cederman, 2010. Representing ethnic groups in space: a new dataset. Journal of Peace Research, 47(4): 491–499. Wucherpfennig J., N. Weidmann, L. Girardin, L.-E. Cederman, and A. Wimmer, 2011. Politically relevant ethnic groups across space and time: introducing the GeoEPR dataset. Conflict Management and Peace Science, 28(5): 423–437. Wright, T., 1991. Center-Periphery Relations and Ethnic Conflict in Pakistan: Sindhis, Muhajirs, and Punjabis. Comparative Politics, 23(3): 299-312.